Short on time or just need an introduction to dementia? Our ‘Quick guide to dementia’, available below in English and 8 other languages, provides the basic facts about dementia in simple terms. Dementia is not a disease in itself. Dementia is a word used to describe a group of symptoms that occur when brain cells stop working properly. You might have general questions about the diagnosis or symptoms of dementia. Perhaps you’re interested in the treatments currently available, or the risk factors for developing the condition. You will find the answers in these pages. Our website ‘Dementia Explained’ helps children and teenagers understand dementia, how it affects someone and how this could impact their lives. The facts and statistics around dementia in the UK, including prevalence, the impact on the economy and investment. You can view, download and order our dementia information booklets and other resources. Alzheimer’s Research UK firmly believes in the power of research to create a world free from the fear, harm and heartbreak of dementia. We believe in the power of research to change the future. You may have questions about the kinds of research we fund and why. For every £1 donated, 85p powers life-changing research and helps people to understand and take action on dementia. The remaining 15p raises our next £1 and funds essential running costs. Without you, there would be no Alzheimer’s Research UK. Together, we really can make breakthroughs possible. Volunteers are a vital force in our efforts to make life-changing breakthroughs possible. Get involved and help us make a major impact. With your support, we can make sure people living with dementia and research into the condition remain a national priority. The only way will defeat dementia is by working together. We are extremely grateful to our partners for their support. We’re here to help you. Please get in contact with us if you have a query about any aspect of our work. We’re joining forces with Alzheimer’s Society for a year-long campaign as Charity of the Year for the Virgin Money London Marathon 2019. Join the Dementia Revolution and help end dementia with research! 100% of profits from our online shop will help fund our pioneering research into prevention, treatment and a cure for dementia. We have built a reputation as a flexible and responsive funder, committed to supporting the best and most innovative ideas from across the field. We have a wide range of funding streams that support work on prevention, diagnosis and treatments. Find out more about experimental resources available, research guidelines and conference opportunities throughout the world. The Alzheimer’s Research UK Research Network is a unique, collaborative venture in the dementia research community. Be the first to hear announcements about Alzheimer's Research UK's 2020 conference. Our vision is a world where people are free from the fear, harm and heartbreak of dementia. Our scientists have been behind some of the biggest breakthroughs in dementia research. We work to develop policy that improves the lives of the millions of people affected by dementia in the UK and across the world. Alzheimer’s Research UK is a company limited by guarantee and a registered charity. We are governed by a Board of Trustees, the Charity’s board of directors. Our supporters are one of our greatest strengths. Find out what is going on in the world of dementia and Alzheimer's disease research with our news articles, blog posts and press information. 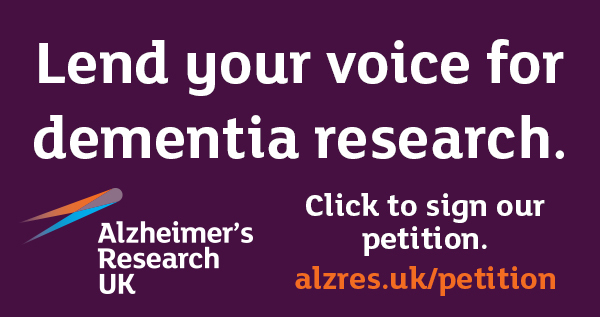 Join the UK’s leading dementia research charity, Alzheimer’s Research UK. Dementia with Lewy bodies is the third most common cause of dementia. Dementia with Lewy bodies can cause common dementia symptoms, including problems with memory and thinking skills. There are also some more specific symptoms associated with the disease. Some of these symptoms are also seen in Parkinson’s dementia. Changes in alertness and attention, and periods of confusion, that may be unpredictable and change from hour-to-hour or day-to-day. Movement problems – Parkinson’s-type symptoms such as slower movements, stiffness in the arms and legs, and shaking or trembling. Visual hallucinations – Seeing things that are not really there, e.g. people or animals. These often happen repeatedly and are realistic and well-formed. Sleep disturbances – Vivid dreams, shouting out or moving while sleeping which can disrupt sleep, and may cause injury. Sense of smell – Problems with detecting smells. DLB is a progressive condition which means symptoms get worse over time. As the disease progresses, people will need increasing help with eating, moving, dressing and using the toilet. DLB can progress slowly over several years but the speed of change and type of symptoms can vary from person to person. This information was updated in January 2018 and is due for review in January 2020. It does not replace any advice that doctors, pharmacists or nurses may give you. Please contact us if you would like a version with references. Was this information helpful? Let us know what you think by filling out this short survey. Want to know more about current research? Keen to get involved in research projects? Contact the Dementia Research Infoline, 0300 111 5 111 9am-5pm, Monday to Friday. Can we reduce the risk of dementia in the over 75’s? Alzheimer's Research UK is a registered charity, numbers 1077089 and SC042474. By registering for ARUK Explorer all participants acknowledge that the Event contains a physical component, and that participation in the Event will be physical in part. You confirm you are aware of the associated medical and physical risks involved and are physically capable of competing in the Event and agree that Hike Events Ltd, its officers, employees, agents, affiliates, sponsors, charities or medical advisers are not responsible for any injury or illness that you may suffer as a result of my participation in the Event. All registrants irrevocably consent to their appearance in the Event being filmed, recorded, incorporated and exploited in whole or in part in any television programme, film, video or broadcast of whatever nature by all means and in all media and formats now or invented after today. All participants irrevocably consent to the use and reproduction of their name, likeness, appearance and photographs, films and recordings by all means and in all media for the purpose of advertising, publicity and otherwise in relation to the exploitation of the Event and/or the promotion of the Event and the commercial rights relating to the Event provided that such use does not imply my direct endorsement of any official sponsor or supplier of the Event. Nothing in these Conditions of Entry shall exclude or limit the liability of Hike Events Ltd for personal injury caused by Hike Events Ltd negligence, for fraud or fraudulent misrepresentation, or for any matter for which it would be illegal for Hike Events Ltd to exclude or attempt to exclude its liability. We regret that we are unable to refund any registration fees unless your application is unsuccessful. Your place in this trek is non-transferable. Any attempt to transfer your place may result in this place being lost, you will not be entitled to a refund if you have paid a fee for your place. If you need to withdraw from this event, ARUK cannot guarantee that your place will be deferred to the following year. You may need to re-apply for a charity place and you may be required to commit to the sponsorship pledge that is set for the following year. By applying for a place in ARUK Explorer, you agree to meet the minimum sponsorship amount of £250 per person. All monies raised as part of your pledge must be paid to ARUK within 6 weeks of the event date. If a deficit to the minimum sponsorship amount remains after this time, ARUK may require you to pay the difference. We reserve the right to refuse any application at our absolute discretion, without providing reasons for doing so. In the event you need to withdraw from the sporting event for any reason you should inform us promptly by one of the methods specified below. We regret that we are unable to refund any registration payment or sponsorship that you may have raised for or paid to ARUK. You can withdraw from your place in the sporting event at any point by emailing sportingevents@alzheimersresearchuk.org or by calling 0300 1115555. No withdrawal fee will be payable to ARUK, however we regret that we are unable to refund any registration payment or sponsorship that you may have raised for or paid to ARUK prior to your withdrawal. Any images, videos, audio or quotes we collect from you in connection with your participation in or fundraising for the sporting event may be used by ARUK on social media, the ARUK or third party websites and in future marketing materials or other publications. If you would like your image removed, please contact fundraising@alzheimersresearchuk.org We will aim to remove all images within 10 working days. We have strived to ensure that the information provided in relation to ARUK Explorer is accurate at the time of publication, timely, unbiased and useful. However, no information provided by ARUK or any third parties should be treated as medical guidance or professional advice. We are not responsible for errors or omissions in the information provided nor any actions resulting from the use of such information, and ARUK makes no warranty of any kind, either express or implied, with respect to this information. Use of the information provided is voluntary. In no event shall we be liable to you whether for breach of contract, any tortious act or omission (including negligence) or otherwise, under or in connection with these terms and conditions for any direct or indirect (i) loss or damage, (ii) loss of profit, loss of reputation, (iii) loss of business, (iv) loss of revenue or goodwill, (v) loss of anticipated savings, (vi) pledges made on your behalf or by you to charity, or (vii) any consequential or indirect loss, regardless of whether the loss or damage (a) would arise in the ordinary course of events, (b) is reasonably foreseeable, or (c) is in contemplation of the parties, or otherwise. On confirmation of your place you will be invited to join one of our sporting Facebook groups. We have the right to use any material posted on the groups in our marketing materials or future communications. We reserve the right to remove or hide any content posted on these groups with no reason given. You understand that the event you are participating in is organised by a third party. You must adhere to the rules outlined by the event organisers, including any age restriction in place. ARUK is not responsible and ARUK’s liability for (i) cancellation of the sporting event and (2) any loss, damage or injury acquired as a result of taking part and/or as a result of cancellation of the sporting event is excluded to the fullest extent permitted by law. These terms and conditions shall be governed by English law. Any dispute arising under or in connection with these terms and conditions shall be referred for determination to the exclusive jurisdiction of the English courts. For Rachel and her 10-year-old daughter Zara, Running Down Dementia gave them something positive to focus on during the stress and heartbreak of coping with a loved one with dementia. They took on the challenge in honour of Rachel’s mum and Zara’s grandmother, who has Alzheimer’s disease. Zara ran the full 100km, while Rachel managed an incredible 1,000km. The duo raised nearly £1,500 for life-changing dementia research. Sign up by Running Down Dementia and run 100km, 300km or a distance that suits you before 31 August. Giving a gift in your mum’s memory is a special and positive way to celebrate her life while also supporting Alzheimer’s Research UK this Mother’s Day. When you donate online to Alzheimer’s Research UK in memory of a loved one, you can dedicate a location anywhere in the world to their memory. You could choose a place your mum loved, somewhere you made memories together, or somewhere that reminds you of her. You can also add a short message and a photo if you wish. Just select that you are donating in memory of a loved one, and once you’ve completed your donation, you’ll be taken through how to select your Place to Remember. Many families like Lauren’s, and maybe yours too, will be celebrating Mother’s Day this weekend. But dementia has taken so much of her mum, Laws. Take a look at their Instagram blog, @dayinthelifeoflaws, which is filled with a range of posts about their mum’s life living with dementia. Dementia comes in many forms and it’ll take all the energy we have to finding a life-changing breakthrough. With your donation today, however much you can give, will take us a step closer to finding an effective treatment. Your help will bring hope to families affected by dementia, today, and in the future. Please donate today, if you can. If you are a UK taxpayer, under the Government’s Gift Aid scheme Alzheimer’s Research UK can claim the tax you have already paid on your gift. This means that your donations can increase in value by at least 25% at no extra cost to you. I understand that if I pay less Income Tax and/or Capital Gains Tax in the current tax year than the amount of Gift Aid claimed on all my donations it is my responsibility to pay any difference. By ticking this box I confirm that I am a UK tax payer and would like all my donations, past, present and future to Alzheimer’s Research UK to be treated as Gift Aid donations. We’d like you to be the first to know about the latest research and how your support makes a difference, as well as ways you can get involved and help fund our life-changing work. We’ll keep your information safe and never sell or swap it with anyone. You can change how we talk to you at any time, by calling 0300 111 5555 or emailing enquiries@alzheimersresearchuk.org. Our Privacy Notice can be found at www.alzheimersresearchuk.org/privacy-notice/ and explains how we will use and store your information. By submitting this form you are e-signing this declaration. Use this form to request all available resources. You do not need to submit individual requests. We’ll keep your information safe and never sell or swap it with anyone. You play an important role in driving the conversation about dementia and championing research that will change lives. We’d like you to be the first to know about the latest research and how your support makes a difference, as well as ways you can get involved at Alzheimer’s Research UK and help fund our life-changing work. We’ll keep your information safe and never sell or swap it with anyone. Please note that only one booking can be made at a time. If you wish to book several people on to this event, please submit an entry for each person. This will be pre-populated with the event you clicked on and cannot be changed. If this is incorrect go back to events. There is high demand for our charity places. Here’s an opportunity to tell us why you want to take part. It’s incredibly important we receive the minimum sponsorship for each event. Tell us your fundraising plans to reach this and go beyond!